This Technique Junkie April Release stamp is so easy to color! It is called Elegant Mums - http://techniquejunkies.com/elegant-mums/. I stamped it with Versamark and then covered it with detail black embossing powder. Then I quickly used my Copic markers and zipped the color over the images. Did I say it was quick? It was -- just a minute or so for coloring. This image is just perfect for those "quick cards" we all need to make at times. Layered on black - then a yellow based card. The saying is from Sentimental Sayings - http://techniquejunkies.com/sentimental-sayings/. Such a wonderful collection of things to say! Stamped with black Versafine ink on vellum and clear embossing powder melted with a heat tool. Do you know what will happen in two days? 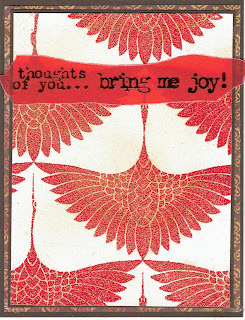 It will be May -- and that means NEW stamps for Technique Junkie Stamps --and there will be a blog hop. Please join the Design Team as we show off our new stamps. And I will have a contest on my Blog Hop post! 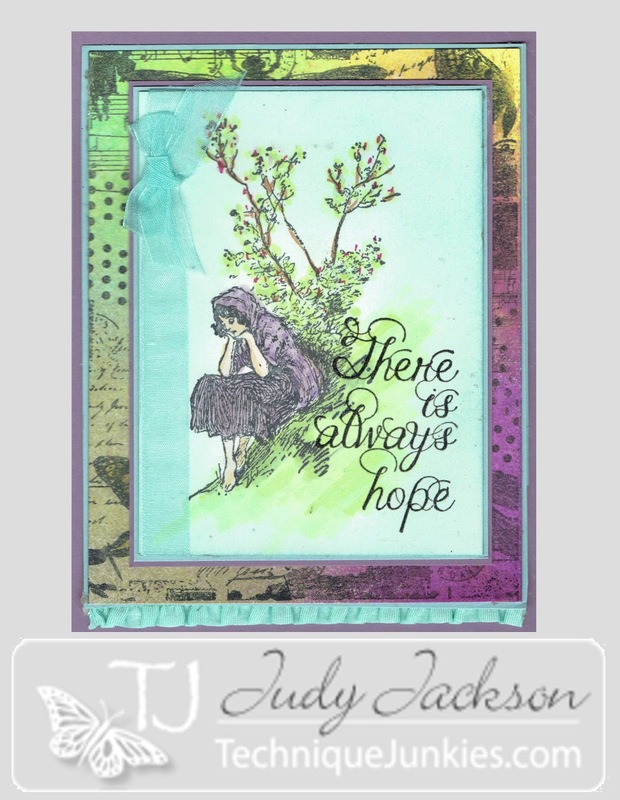 This Technique Junkie Stamps April Release Swans - http://techniquejunkies.com/swans/ is such a different stamp. And yet it is quite versatile. I stamped the swans in black Versafine and heat embossed clear embossing powder on white card stock. Then I used a watercolor medium and painted over the swans and the background with wide sweeping brush strokes. That way the watercolor went in between the feathers on the swans. I still wanted shimmer however. So I used Gold Dust Shimmering Minx - http://techniquejunkies.com/gold-dust-minx-shimmering-inks/ - over the swans to further highlight and add that delightful shimmer to each swan. Then I used my Gold Luna of Stella pen and went over the pale yellow background right in the damp watercolors. Delightful! I layered the focal image on black card stock, added a narrow strip (1/2 inch wide!) of glimmer paper layered on black card stock. 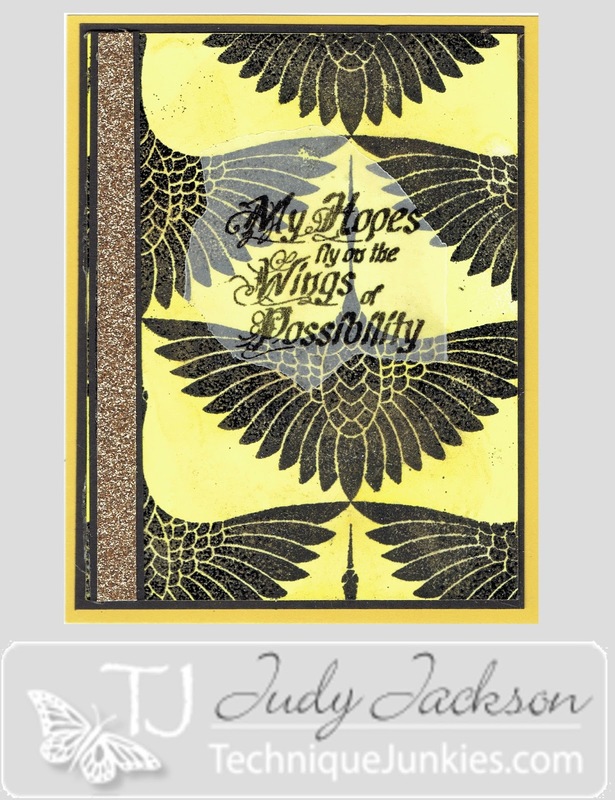 The verse is Wings of Possibility - http://techniquejunkies.com/wings-of-possibility/ - a Technique Junkie stamp. It just goes with this golden swan card! Think of all of the possibilities awaiting each one of us! 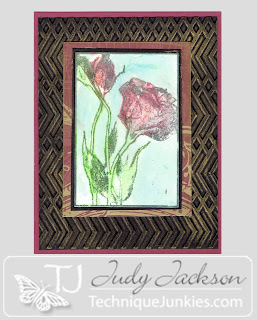 Stylized Roses -- A Favorite! This beautiful stamp is a Technique Junkie April Release -- Stylized Roses - http://techniquejunkies.com/stylized-roses/. I love this stamp - it is so pretty and soooo easy to color. But I am sad to say that the ribbon truly matches the rose in real life when it scanned it didn't. 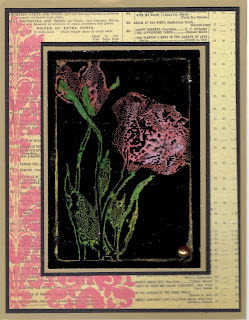 This technique of stamping an image sideways is from the Technique Junkie newsletter in the February March issue called Diagonal Images. But I do not have just one card for you today -- I have several, so sit back and Enjoy! 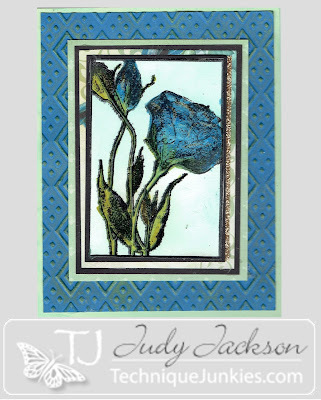 Everyone seems to like blue roses -- so this is my attempt. I used black Versafine ink and detail black embossing powder and heat set it. Then I painted the roses and leaves with Twinkling H2O's. The pale blue sky is done with the Copic Air Brush System - set 2. I used an embossing folder with blue card stock but it was too just blue for me -- does that make any sense? So I rubbed some green metallic rub-ons over the raised dry embossed areas. Various layers of papers and card stock are used used to add visual interest. This was an experiment. I used some heavier card stock I sprayed water all over and then squirted 3 different colors of Color Burst powder. I used my heat tool and dried it before stamping the rose on the paper. The paper with the bird cages was white with the gold cages and I burnished color all over that matched the pink in the of the "roses" and the base card stock. Lots of layering once again. My Dad was from Texas -- and so a yellow rose of Texas is good. These are just water colored, and highlights of rust were added. Gold ribbon over a dry embossed script panel, highlighted with gold rub-ons was added. The verse if Technique Junkie stamps Seeds of Today - http://techniquejunkies.com/seeds-of-today/ which is heat embossed with gold powder. And of course lots of layers add interest. This is a disappointing scan but somewhat expected. The funny looking strips on the left are very shiny metallic gold. And the verse is Technique Junkie Stamps Kindness Matters - http://techniquejunkies.com/kindness-matters/. 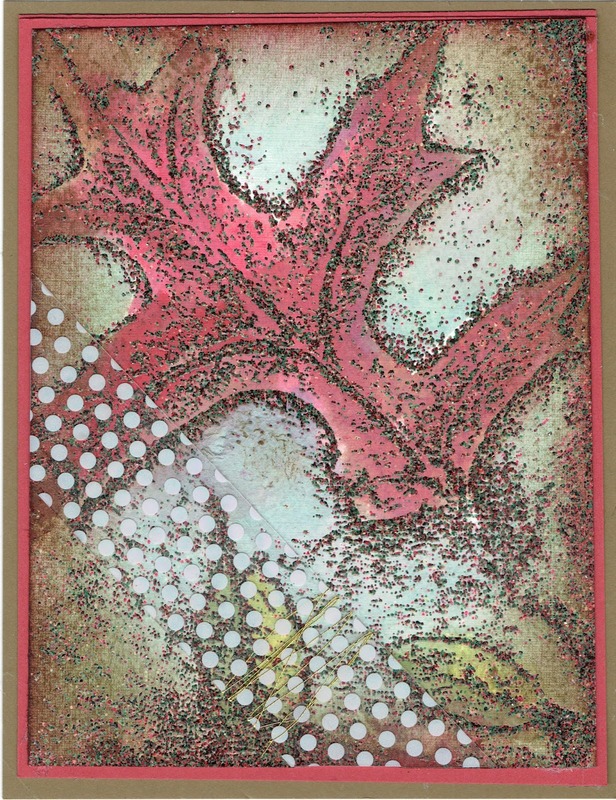 I used clear embossing powder over the Versamark stamped image. Then I burnished the color over that with sponges. Then while my stamp was still in the MISTI, I reinked it with black Stazon and it stamped black so it showed up a bit better. These roses were colored with my Copic Markers, I used lots of layers of card stock and some glimmer paper. 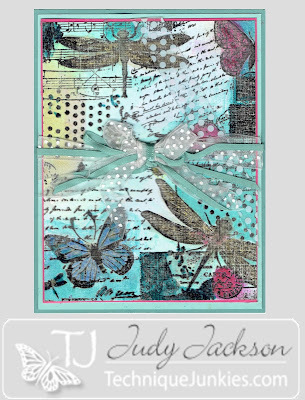 Since there were so many butterflies in the background -- I used Technique Junkie Stamps Butterfly Kisses - http://techniquejunkies.com/butterfly-kisses/. And my very last card for today is this one! The roses are stamped with black Memento ink and water colored. And the sky is just water colored as well. 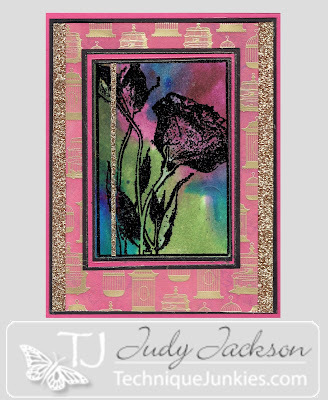 It was layered on a scrap of background paper and then layered on a black panel which was dry embossed and highlights added with gold rub-ons. 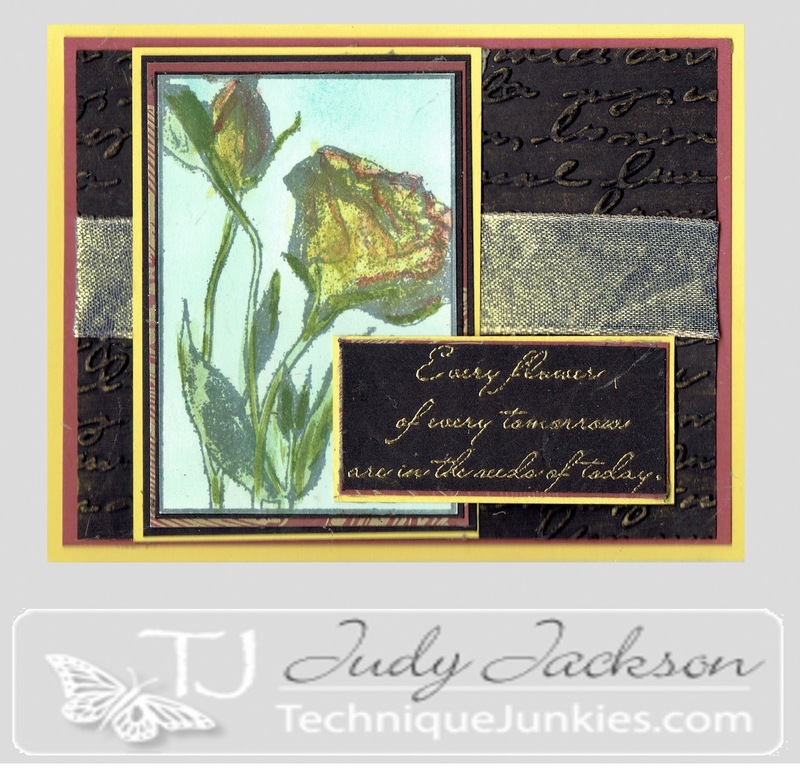 So here you are -- lots of roses from Technique Junkie Stamps. The same stamp -- so many different ways to use it. Pat Huntoon showed us more here - http://techniquejunkies.blogspot.com/2016/04/tj-inkspirations-my-rose-garden.html . Kathy Stacy had a post here -- https://craftynurse4u.wordpress.com/2016/04/13/live-love-laugh/. Have you decided you must have this by now? 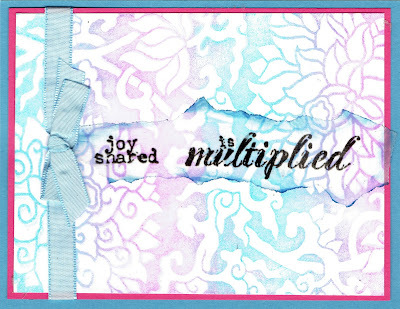 I love this stamp -- it is so very versatile! It can be used independently as I did here, or as a background stamp, or pieces of it can be used in a variety of ways. This is a new Technique Junkie April Release stamps -- Dragonfly Collage - http://techniquejunkies.com/dragonfly-collage/ . Versatility is a mark of a excellent stamp to own. This stamp just begs to be used! Often when I think of butterflies and dragonflies -- I think of iridescent shades of color. But that isn't always easy to depict in coloring a stamp. I again used a variety of coloring mediums on this stamped image. Some were colored with Copic markers, some were water colored, and some I used glitter on. And some areas of the glitter i added a few highlights with a Copic marker! There is a ruffled ribbon at the bottom of the card and the small bow is attached with a glue dot. It just seemed to need "something " in that spot! How many ways can you think of to use this stamp? Summer time and sea shells -- they just seem to go together.I stamped all of the sea shells on a blue gray piece of card stock. Then I covered them with a variety of colors of embossing powders, heat set them, and then fussy cut them out. I added watercolor paints over the embossing and let the watercolors sink into the card stock to add the other subtle color differences. The base card is a pale aqua. On that I layered a a tan colored card stock and over that is a piece of tan vellum on which I stamped a couple of background stamps and used a pale tan embossing powder. I used the stamp Wasted* without a block. I inked it up with Versamark -- curled the stamp and used the smaller dots in different places in the Key Script stamped image. Shells, Set of Four - http://techniquejunkies.com/shells-set-of-4-palettini/. The verse from Shells is inked with Black Versafine ink, and covered with clear embossing powder.I used a watercolor marker and colored in the spaces in the letters. It is layered on a die cut piece of tan card stock. Have a wonderful day and may the days be getting warmer and warmer -- and get inky! I enjoy vintage images to color. I enjoy looking at vintage items in various places. This young lady appears to be so very contemplative. But I wonder why. Is she humming a tune? Is she thinking about what's for supper? Is she wondering how she will tell her Dad or Mom about a problem? Is she watching the fish in a stream just below? Dragonfly Collage - http://techniquejunkies.com/dragonfly-collage/ - An April Release! I chose this verse to go with the young lady's contemplative mood.I used Copic markers to color her and tree in -- and sponged in the sky. 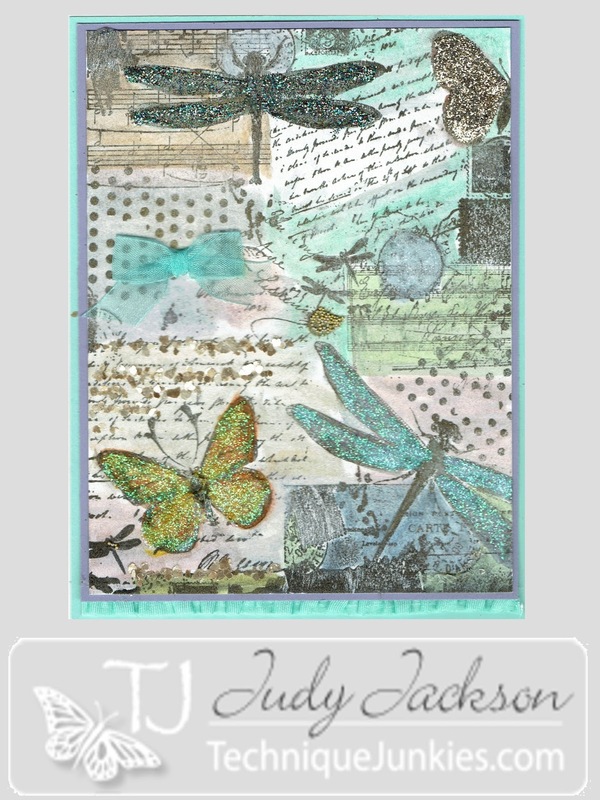 The Dragonfly Collage stamp was used as the background -- and I used Art Anthology Colorations spray to add the color. 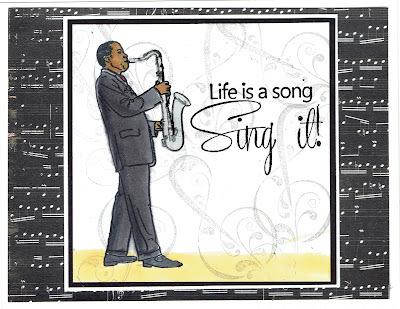 You know when a stamp is a great one to have when you can use it in somany variations -- and that is true of this stamp! So versatile and wonderful! Summer time is a time for beaches and waves and fun in the water. A lot of people also like to observe nature and animals at the shore. This crab set - a Technique Junkie April release set - is just plain fun to stamp and use. I stamped the Sea Waves in blue on white card stock. I stamped the verse in the upper left area with Black Versafine ink, covered with clear embossing powder and heat set. Then I filled the spaces in the letters with a pale blue marker. 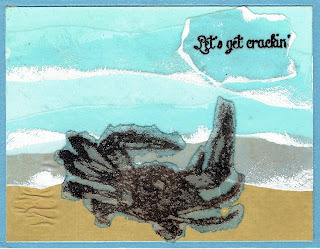 The crab was inked up with black Versafine ink and then covered with an embossing powder that had a variety of shades in it -- browns and grays and olives and rust. It was stamped on vellum. I colored in the bare areas from behind the embossed image on the vellum. Tearing vellum always adds some interest to the verse or focal image on the vellum. To add a touch more visual interest I sponged the edges of the torn vellum with a little gray ink. To finish the card I layered the sea waves on a gray card stock panel and then on the light aqua base card. A fun card for sure! I hope you enjoyed it! Have a great day --- and get inky! My brother-in-law is not into sports. He knows they exist but he doesn't ever watch them. However, many years ago he moved for a job relocation to Baltimore when his three sons and daughter were entering (or about to enter) their teen years. And today his three sons and daughter love the Baltimore Orioles. They have gone to more than one game in their lifetime. I, on the other hand, have never been to a professional game for any sport. But if I have to watch a pro-sports game on TV, I would choose something with a little more action than baseball. I would choose football or basketball over baseball any day. But those boys are just not "my way" -- they love baseball. And this week there were several references to the Orioles in their Facebook posts. And believe me, you do not want to play Trivial Pursuit with them period -- but especially if the question has anything to do with baseball -- and if the question has anything to do with the Orioles - forget it you will lose. They WILL know the answer. One of them compares all sorts of things that he has done according to different trivial statistics from baseball. Those statistics might all be about the Orioles -- I have no idea. At least I do know if the references are about "runs batted in" or "number of perfect pitches resulting in strike outs" that those are references to baseball and not basketball. In honor of my nephews and my great nephews who played baseball in college -- here are these cards. 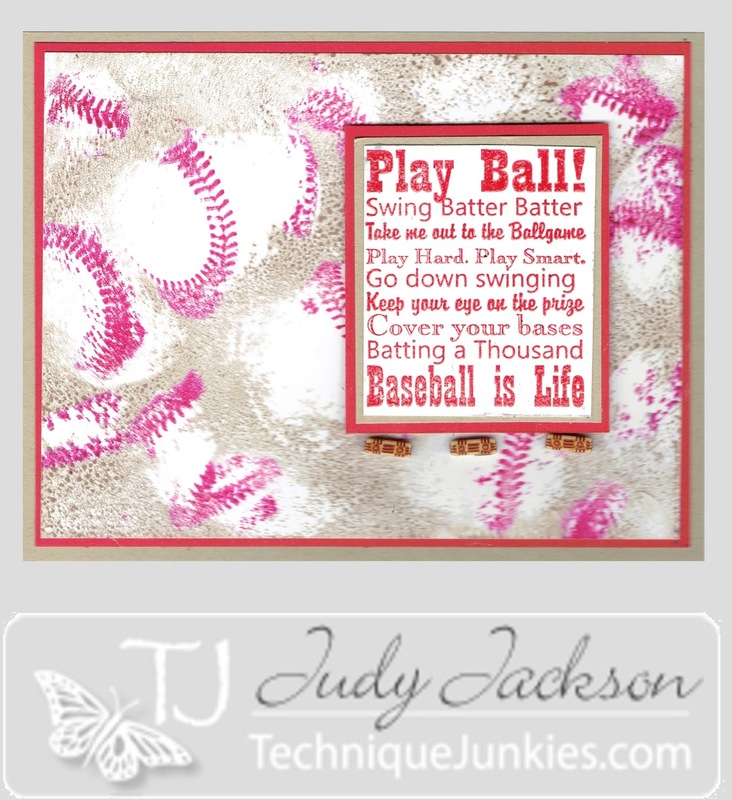 They are created with Technique Junkie April release stamps -- Swing for the Fences (http://techniquejunkies.com/swing-for-the-fences-set-of-7/) and Baseballs - (http://techniquejunkies.com/baseballs/). For this first card, I inked the Baseballs background stamp in tan and then very carefully wiped off the tan ink from the stitch lines. Then I used a red marker and colored the stitch lines. The greeting is first stamped in Versamark and then in the bright red ink. I stamped it on the card stock and covered it with clear embossing powder and heat set. Several layers of card stock were used to finish the cards. I added a few wooden beads with some red paint lines. Glue dots adhered them. The verse is popped up and the beads were quite small and so were about the same height as the popped up verse. This next card is made with the same set of stamps above. The background is inked up with a darker brown ink. Then I stamped the baseball mitt on the wooden embellishment from my stash. I heat set it to be sure it was dry and rubbed the wood with an anti-static bag to prevent stray embossing powder from sticking. I over stamped the verse with Versafine Black ink on the mitt and and the empty space. I covered it with clear embossing powder and heat set. I wrapped some Baker's Twine around the card, added the layers, and adhered the wooden embellishment with several glue dots. I opted not to try and color the mitt but let the natural color of the wood be its color. 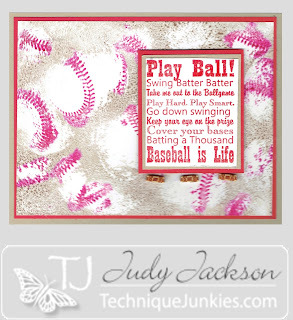 Have a great day - maybe watch a ball game, and get inky! 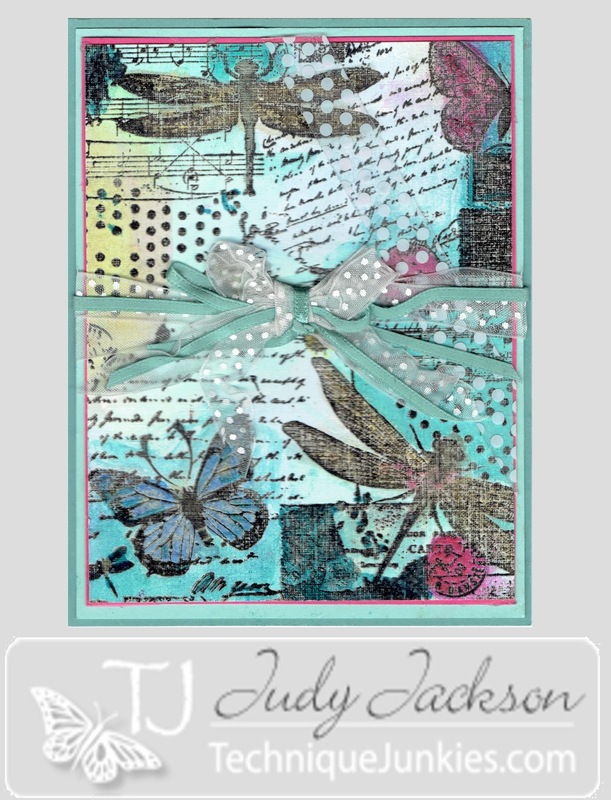 One of my favorite Technique Junkie Stamps April releases is the Dragonfly Collage - http://techniquejunkies.com/dragonfly-collage/. 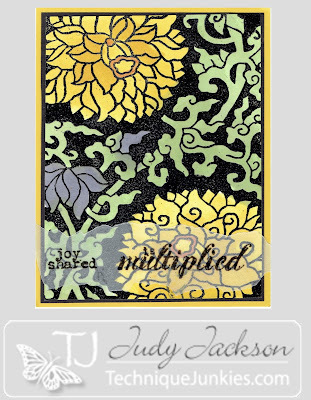 There are so many aspects to this stamp -- and so many different areas in which you can add texture -- and only with color in different mediums. That is what I did here. This is going to be difficult to describe what I did with this stamp because I would do one thing and look at the stamped image. Then I would another thing. I went from section to section on this stamp -- and kept adding more color and different details until I was done. 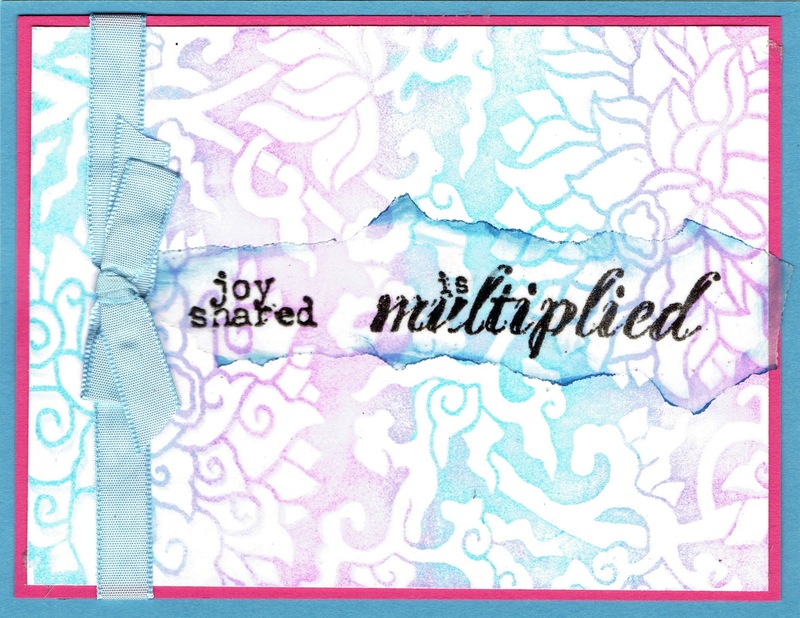 One of the things I have learned over the years of stamping is to, "Stop, look, and listen to your creative muse" at each step along the way. Because some things will just "say" well this card needs this or it needs that." But you have to allow time to ponder for those things and not just keep adding things and doing something different. 4. I mounted it on several layers of card stock. I just keep doing a little bit at a time until I was satisfied with the results. Then I tied three ribbons around the middle all at the same time. The ribbons were white dotted organza ribbon, a pale silvery gray organza ribbon, and a thin satin ribbon that matched the color of the base card. I also added a narrow strip (about 3/4 inch wide) of clear acetate with white dots at an angle on the top right corner of the card. It just sort of blends in and you have to look for it to see it in the card. I hope you ordered your April releases during the sale period! This is only to show you the very subtle differences between regular white card stock and glossy card stock. When you are trying to decide -- test both. Remember it is only paper. However, I will say this - when you are stamping photo type stamps - glossy paper is the only thing to use. It makes a world of difference in the fine details in photo stamping. I mounted both sheets of card stock on hot pick card stock and then on the blue.The pale blue ribbon is tried around the pink card stock before being layered on the base card stock. The first verse is from Sentimental Sayings - http://techniquejunkies.com/sentimental-sayings/ . The second verse is from Mae West Sentiments 2 - http://techniquejunkies.com/mae-west-sentiments-2-set-of-5/. Both are Technique Junkie Stamps! The verse are stamped with Versafine blackink, covered with clear embossing powder and heat set. They vellum was torn around the verse. I sponged a slightly darker blue ink than the base card stock because I felt it showed up better and yet it blended well. Please remember that today is the last day of the April Release Stamps Sale of 15% off of all of the April Release stamps. You can see them all here -- http://techniquejunkies.com/april-2016-release/. Which ones are your favorites? What will spark your creativity today? Get inky! It is an odd time of the year to post a very fall looking leaf. But I hope you will understanding my reasoning when you read my blog post today. 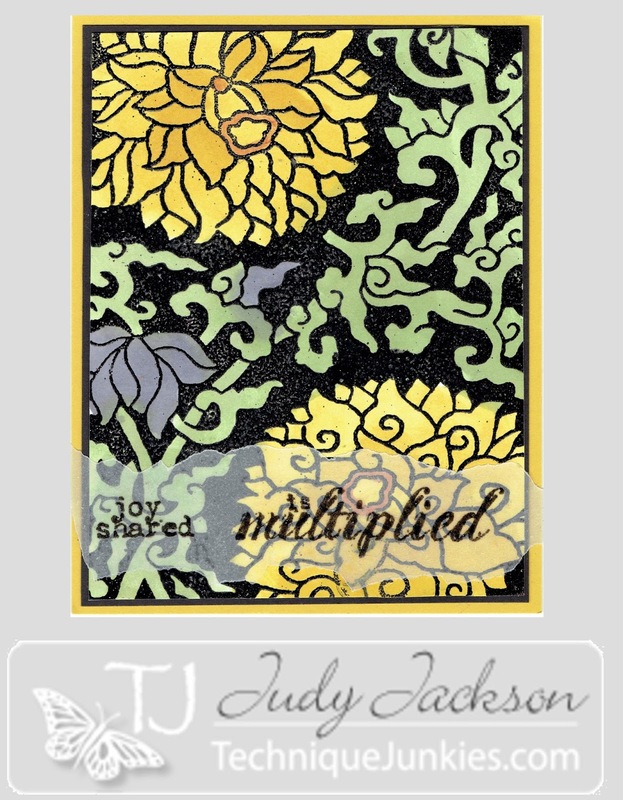 This is not an April 2016 release, but it is a Technique Junkie Stamp September 2015 release - http://techniquejunkies.com/oak-relief/. I loved this stamp as soon as I saw it. But for a variety of reasons, I was not able to get it until recently. As I am sure any of the people who follow this blog on a regular basis know, my husband passed away very suddenly this last year. And the oak tree and leaf had already become a symbol of my hubby and his family not long after his own father died in 1979. My hubby was very creative with words and language. He often expressed deep emotions and funny thoughts in written words. Most of his family were "Word Smiths." They enjoy the odd twist of a phrase, enjoy employing words in unique and different words. It is not my skill at all. The day before his own father died from cancer (and the entire family knew it was coming) he sat very early in the morning on our sofa and watched the many oak trees in our yard. If you have oak trees, you may have noticed that usually the leaves turn brown in the fall and quite often they do not all fall until spring when the new leaves bud and begin to leaf out. That year it was different. The leaves fell -- every single one. And he sat down and wrote this poem. 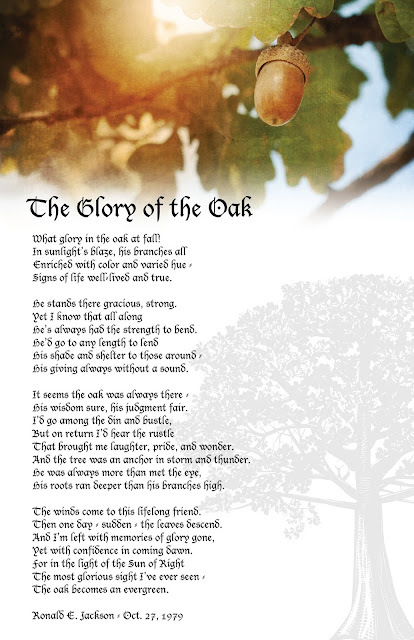 I was able to get the poem placed over this design (by a friend of my hubby's) and it was in the funeral bulletin. So at my husband's grave site we had planted an pin oak tree. For many reasons the burial did not happen at the time of the funeral. It happened in the fall. Just a few days before the burial, I went by the cemetery. Every leave on the tree was bright red. This is the leaf I picked to bring home that day and I included in the frame with the above poem/artwork. I have gone through many firsts this year since his death. Most of the first are events in which his absence was really missed. My kids miss their Dad, the grandkids miss their Poppa. And they talk about him from time to time. So this card was created to remember him, to remember his family. I will be making cards for each family (and it is a large family) to mail out near the date of his death. I plan to use the card above as my inspiration. I do not have enough of everything to make that many but I think I can improvise. So how did create this card? I inked it with Versafine black ink. I then covered the ink with African Embossing powder from Paper Odyssey in Arkansas. I do not know if they are in business any more. Then I used reinkers in reds and browns to watercolor the leaf and its surrounding areas. I added a strip of acetate that had white dots printed on it. I wrapped some thin gold thread around the acetate securing the thread with a glue dot that I carefully placed behind a white dot. Then I layered it on dull red card stock (Riding Hood Red) and then on a lovely tan card stock. It is simple because I wanted the leaf to be the true focal point. 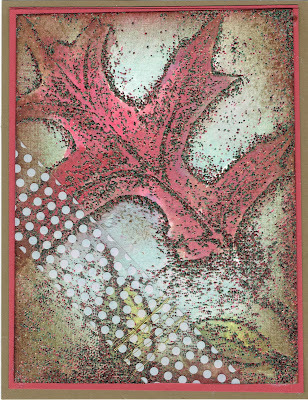 I hope you can now understand why I am showing this fall looking card at the beginning of spring. Spring is a time of new beginnings. I am adjusting to my new beginning and a new normal for me. The grief is still very much there but it is not as raw as it was months ago. There are times I can talk about it now without crying my eyes out. There are fewer times that I do cry when I do talk about it. Life goes on. God goes with me. God is my helper at all times and especially in these times of grief. Thank you for bearing with me and reading this long post without much stamping. God bless and for goodness sake -- get inky! My jazz player (Technique Junkie Stamps The Saxophonist - http://techniquejunkies.com/the-saxophonist/) is in the orchestra -- and he is being featured so he has stepped out to the front. Can't you see all the folks in audience clapping along to the beat? I stamped the Technique Junkie Treble Clef Small - http://techniquejunkies.com/treble-clef-small/ in the background first. Then I added the Saxophonist in front with black Memento ink. 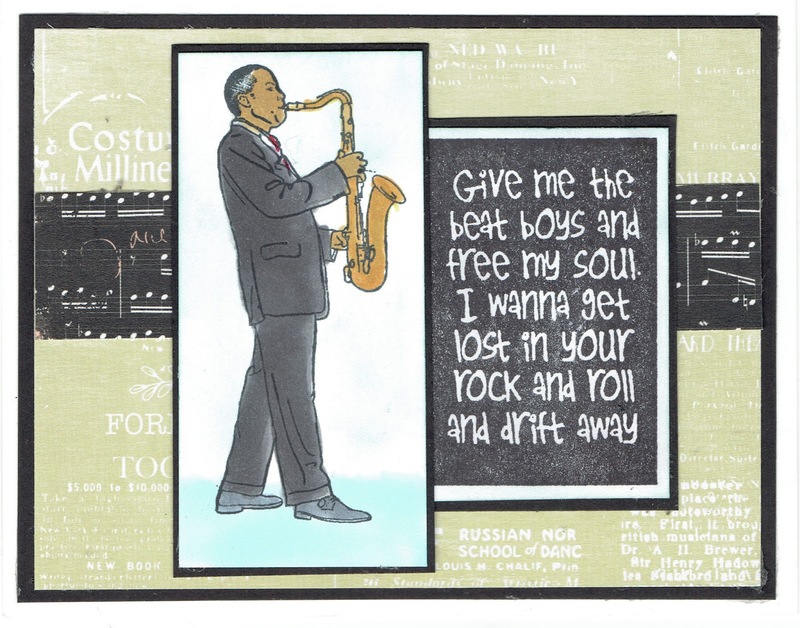 I colored the saxophone player with Copic markers. I then colored in the saxophone with a silver marker. Because silver ink is opaque, the lines showing the detail pf the saxophone were now gone. But MISTI - http://techniquejunkies.com/mini-misti-most-incredible-stamping-tool-invented/ - to the rescue! And Technique Junkie Stamps sells them! Next I only reinked the saxophone with Black Versafine ink. I covered only the saxophone with detail black embossing powder, dumped off the excess, and heat set it. Now the details on the saxophone show up perfectly! I stamped Technique Junkie Stamps Life is a Song - http://techniquejunkies.com/life-is-a-song/ - to the side. The verse is stamped with Versafine Black ink, covered with detail black embossing powder and heat embossed. 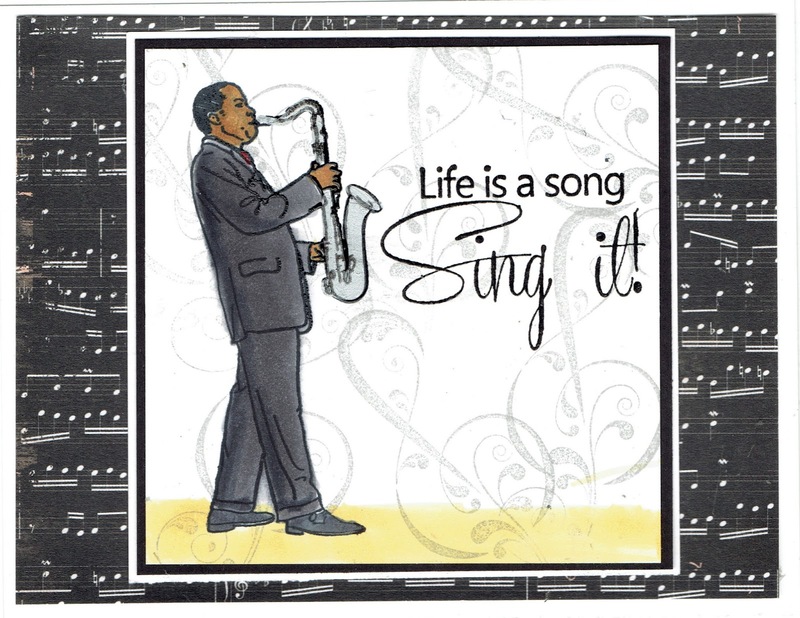 Music background paper is placed on white card stock for the base card. I wish this showed up better. 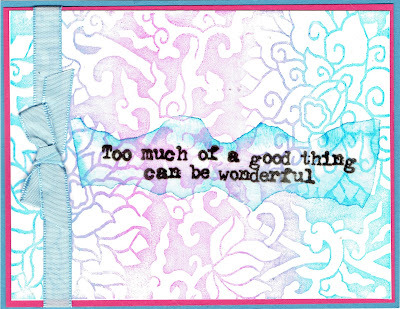 It is sucha lovely card -- it needed no other embellishments -- at least in my mind! Have a great and inky day. It is cold here today -- so it is a good day to stamp! 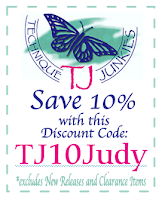 Don't forget -- all April Release Technique stamps are 15% off through April 8. Be sure and check them out! Welcome April! New Stamps! New Sale! Welcome to this Blog Hope day for Technique Junkie stamps! Please view every Design Team member's blog. We start at the beginning -- http://techniquejunkies.blogspot.com/ . I love April! The weather is warmer, the promise of summer is whispering, "I am coming. Hold tight - I will be there before you know it!" But as I write this winter is trying to hold on tight! While the temperature was nice (about 59 degrees) the winds were high and it felt so cold. And so today is April 1, But this is NOT an April's Day joke. 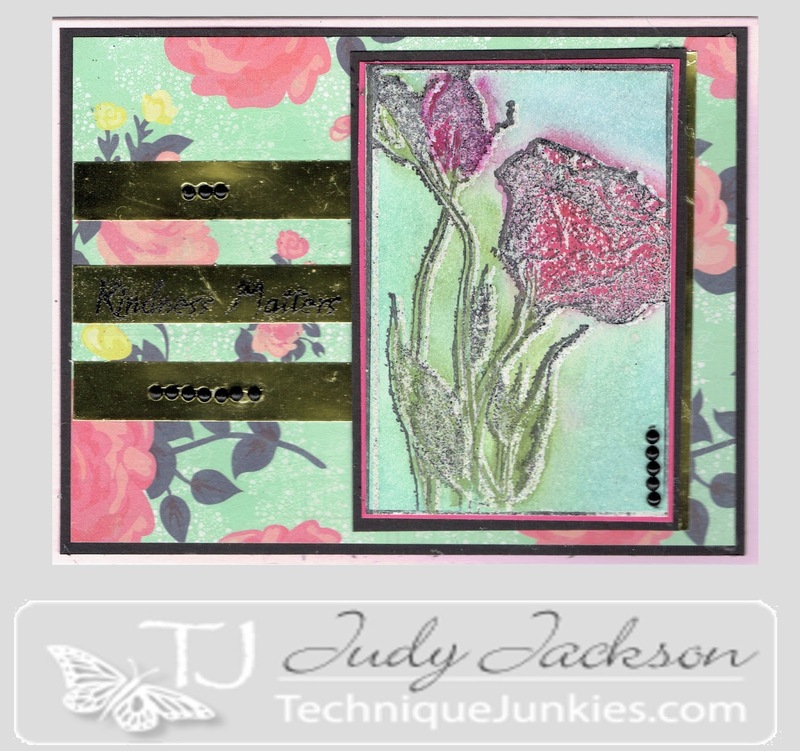 Today we have a blog hop to showcase the new April Releases for Technique Junkie Stamps! And there is a 15% off sale on these stamps until April 8! So be sure to join us on the hop and want to buy, and then place your order! This sale is not an April Fool's Day joke -- it is for REAL!!! I must indulge in a bit of nostalgia for a moment. I taught school for 27 years before retiring. Most of those those years were in first grade. Every year on April 1 I used felt figures I had drawn and cut out to tell an April Fool's poem. After we had practiced it a bit, my class would go around the school to the main office, to the business office, to the cafeteria, to the nurse, and well anywhere we were allowed to come and share our April Fool's Day poem. And this was the poem. And girls and boys have more. Do you believe my story? 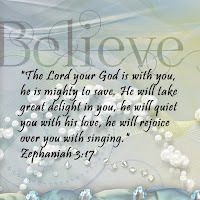 Do you believe my song? And now back to business! I also love getting new stamps! I really enjoy visiting different stamp stores when I travel. I always wonder what do they have that I must have? And it is always exciting when I get a package in the mail from Pat Huntoon. It means new stamps! Sometimes it is stamps I chose and ordered and paid for. And sometimes it is stamps that Pat has selected for me to have. I know of no stamp company where the designers get to choose what stamps they sent. Did you know that? But it is always exciting to see what stamps I will receive! Often, when I see a new stamp, I immediately have an idea of what I should do with this stamp. Sometimes, I have to ponder it a bit more. But these kinds of things challenge us as stampers, and that is a good thing. And now -- back to stamps and cards. That is the main thing on my blog hop today! 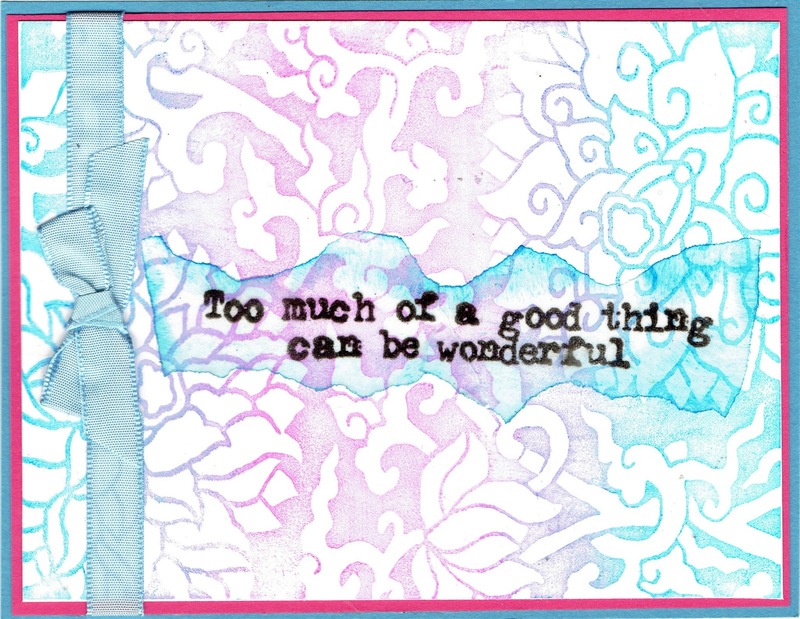 So here is my first card for this Blog Hop -- I will have four!
. 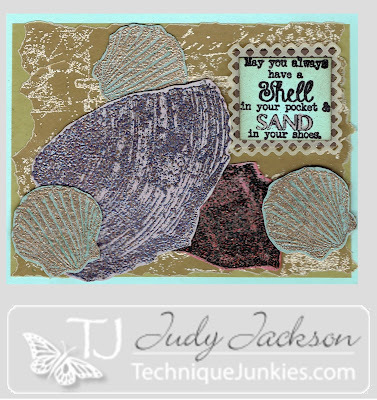 Then I used the Technique Junkie stamp called Free My Soul http://techniquejunkies.com/free-my-soul/ for the verse. You may remember that this stamp has a guitar on the left hand side. But layering my musician over the guitar to show the verse works just fine. And I think the verse goes very well with the jazz guy just fine. 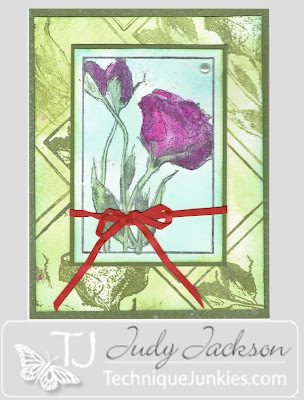 Then I have this lovely rose stamp that is an April Release Technique Junkie stamp called Stylized Roses. . I love this stamp. As soon as I saw it I immediately thought of the Technique Junkie technique called Smooch Direct from the October/November newsletter. So I applied my Smooch paints directly to the rubber of the stamp. (Be sure to clean your stamp right away.) I layered it and used background paper that I felt tied it all together. The background paper had the pink over the vintage newspaper look. It is not a stamp. I used a pearl in the bottom corner, and "antiqued" it with a Copic marker. I had an inspiration for this card.So I hope you like it. I thought of layering strips of tan and blue vellum to sort of show as the sand and waves of the ocean. I sponged each edge of the blue vellum with Versamark and dipped it in white embossing powder and heat set it. 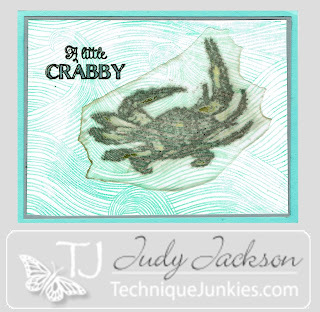 Then I stamped the new April Technique Junkie April release crab on card stock vellum. I inked it first with vellum ink and then inked it with a dye based Soft Suede ink. I covered it with clear embossing powder and heat set it. Then I used a brown marker and colored on the back. Both the crab and the verse are from a Technique Junkie April Release stamp set called Crabby, Set of 3. Now this newly released Technique Junkie April release stamp is called Swans. I inked the stamp with vellum ink and then covered it with Red Dragon embossing powder and heat set it. It is on plain white card stock. The embossing powder is red with flecks of gold in it. Then I had this inspiration -- could I use a newish product that Pat carries on the embossed section and put gold ink in the white lines separating the feathers of the swans? I tried it and it worked! I used the dropper tool in the bottle and used small drops of the gold Minx ink and spread it around on the embossing powder with a damp paint brush. http://techniquejunkies.com/gold-dust-minx-shimmering-inks/ There are several colors of the Minx ink -- I only have a few colors.Then I spread some gold glimmer spray on the white card stock. Then I used some red vellum from my stash and stamped the saying from Technique Junkie stamps PS005 - Sentimental Sayings http://techniquejunkies.com/sentimental-sayings/ . I used black Versafine ink and clear embossing powder. I used my X - Xyron machine to put adhesive on the back. And remember -- all of the April Release stamps are on sale for 15% off through April 8. And that is no April Fool's joke! April is a wonderful time to get inky with new stamps!